Steve Krenz of the Learn and Master Guitar DVD course is professional guitarist and instructor with a wealth of knowledge about playing, and teaching the guitar. His courses Learn and Master Guitar, and the new Learn and Master Spotlight Series: Blues Guitar convey nothing but pure professionalism, and a love for teaching. Disclosure: The reviews written on this site are carried it by professionals, who receive compensation from the companies whose products get reviewed. We test each product thoroughly and recommend only what we believe to be the very best. We are independently owned and the opinions expressed here are our own. The best part of Steve Krenz's teaching style is that he doesn't take things for granted, and explains every concept in a detailed, step-by-step understandable manner, which is one of the most important elements of being a good guitar teacher. Many teacher fail to recognize the fact that things that may seem evident to them, will not be understandable to the student. This is especially important with a DVD guitar course, where the student can't ask questions freely. And this is why Steve's guitar course is invaluable to you if you want to teach yourself guitar. 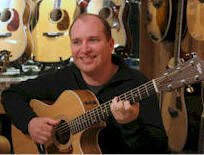 Steve Krenz wrote the Learn and Master Guitar course with 1 aim. To get people, even absolute beginners learning and playing the guitar. This is fully achieved, as the course is structured in a way that leaves no questions unanswered. Each DVD, or session as they are called, builds onto the previous, meaning that an absolute beginner who has never touched a guitar in his/her life, will be able to progressively gain a deeper understanding of the instrument, and develop their skills in a comfortable manner. You alone set the pace of the lessons, meaning that if you want to spend 1 week on each DVD, you can, but if you feel you need to spend 3 weeks on a particular topic, it's totally OK. Learn and Master Guitar by Steve Krenz is one of the most effective ways of learning the guitar without a private instructor. Actually, Steve is your private instructor 🙂 You can't ask live questions, but you can turn to the community forum, browse what other people have asked and shared, and ask Steve questions of your own if you like. If you have been thinking about learning to play the guitar through Steve's Learn and Master course, rest assured, you will be getting some of the highest quality guitar educational material available. Don't waste your time with free YouTube videos, you will have huge gapping wholes in your knowledge, and probably fail to learn the guitar. Learning in a structured manner is the best thing you can do for yourself if you want to learn to play by yourself, and now you can get the entire 20 DVD package for $99 (instead of the original $249). There are only a limited number of discounted courses available, so make sure you order before the offer expires. Remember that the course comes with a full money-back guarantee, so if you don't like it, simply return it. But I'm 99% sure this won't be the case. I am a acoustic guitar player. I wonder if this course is more for the eletric or acoustic guitar players. How many lessons or dvds are dedicated to acoustic? Hi there, I would say it’s 60% acoustic. The course aims to introduce you to all aspects of playing guitar, including electric guitar. Thank you very much indeed for the informative website. What is the difference between Steve’s Learn and Master Guitar and his Learn and Master Fingerstyle Guitar, which one is newer, and which one do you recommend. Hi, the main course is the Learn and Master course, that is meant for beginners. The Fingerstyle course is newer, but it’s not for beginners, it’s more of an add-on after you finish the main Learn and Master guitar course. for any of your readers on the fence about Learn & Master, I highly recommend it. I paid more than $99 for it but it was definitely worth it. I’m 62, started playing 4 years ago when a friend gave me a good guitar (Martin! ), learning via Steve Krenz. I also bought their Fingerstyle guitar course. Can run through a surf set of 6 tunes on the stratocaster (my xmas present last year!). Don’t sound like Hank Marvin but do sound like the Ventures! I practice 30-60 min daily. Don’t spend enough time on technique but do work on some harder songs now and then. Your stuff is very helpful. Love learning new songs & techniques. 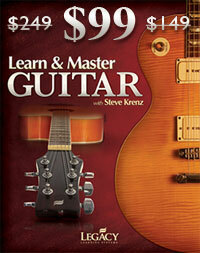 I would like to purchase the Learn and Master the Guitar (Steve Krantz). How do I go about doing that? Also, is the $99 price still available? Yes, I just updated the link, it looks like the page on their site isn’t working any more, but you can still find it for that much here. Love this sight…would like to buy the “Learn and Master Guitar” at the $99.00 dollars price. Is it still possible? Thank you!